Looking for tips and tricks for the upcoming Flea Season? -Where to go the morning of the Flea and what the heck to do! -How to make the most of the Flea! 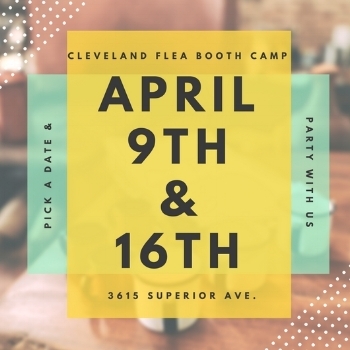 The cost of Booth Camp is $50 (this fee does not apply if you received a separate invite from the Cleveland Flea). This camp is one day only, you do not attend both offering dates. Choose one that works best for you and come to that one. *Unless Team Flea has indicated to you otherwise, you are not required to attend Booth Camp. However, we highly recommend it for any and all Flea Vendors! Booth Camp is a workshop we are offering ALL flea vendors who want tips and tricks for making the most out of the 2018 season! It's also an amazing opportunity to connect with Team Flea one on one to answer any questions you may have. Booth Camp is perfect for new vendors but also for experienced ones who want to up their game this season. It's going to be a jam-packed 2 hours of great information that you won't want to miss! Click below to buy your spot!